I lead the design effort to improve the way campaigners would collect shipping fees for perks. Indiegogo is a crowdfunding site based on a marketplace model. Campaigners launch and manage campaigns to raise funds for their ideas and backers support these campaigns by making financial contributions in return for “perks” or products that will eventually be shipped to them. One of the challenges faced when offering perks on Indiegogo, was the inability to collect shipping fees and specifying different rates based on the different locations of domestic and international backers. As a result of this limitation, campaigners would have to reach out to customers off-platform and request additional money for shipping fees or they would create separate perks on their campaign for the sole purpose of collecting additional shipping fees and instruct backers to select those perks based on their location. Our goal was to build a better end-to-end experience that allowed Campaigners to create perks and easily specify the additional cost of shipping those perks to backers to any location. 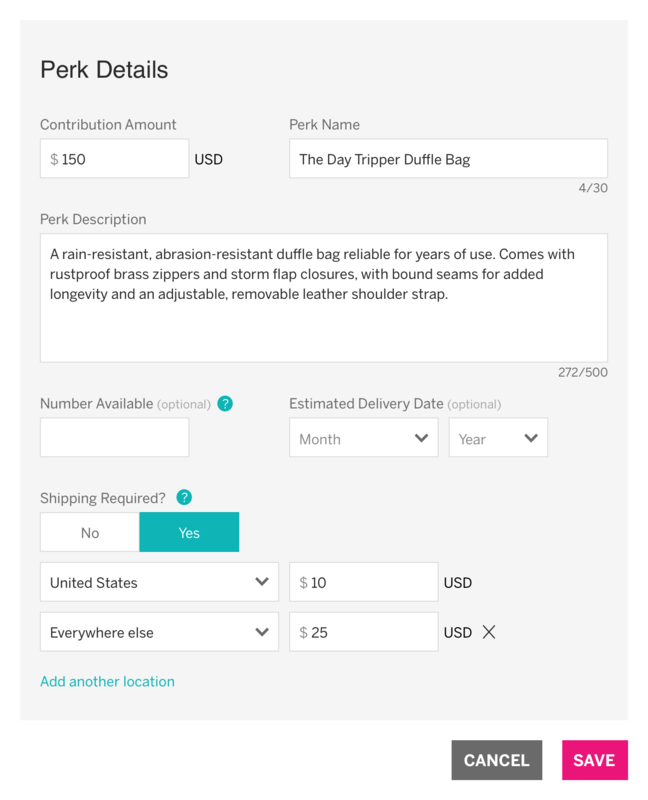 Backers would know which perks are available in their location, and would automatically be charged and informed of the cost of shipping during their checkout experience. 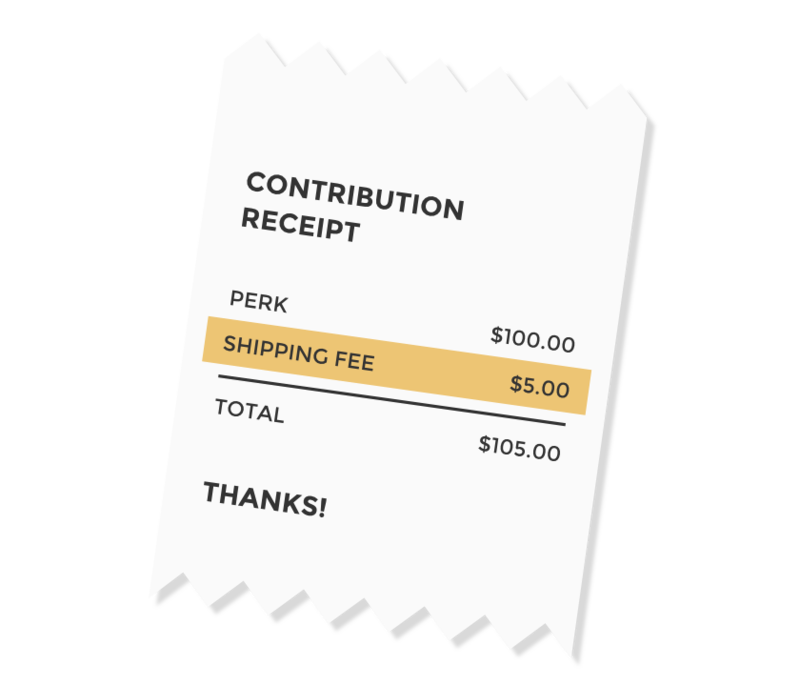 Campaigners should to be able to apply a set of shipping rates for multiple locations for each perk listed on their campaign. Campaigners should be able to set a single rate for a large region such as “Worldwide” or “European Union”. Campaigners should be able to add country-level exceptions that would override any regional rates. Based on our hypothesis and scope, I led the design team in a quick ideation phase where we developed three possible interaction models that we felt were possible solves for the feature. I like to initially sketch my design ideas using analog mediums such as pen paper. 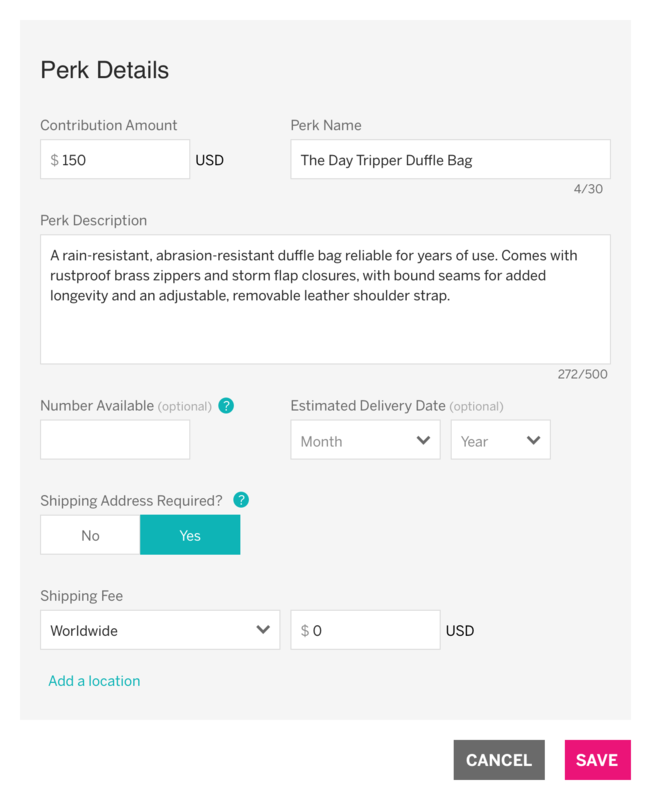 The first design proposal presented campaigners with a simple toggle to specify whether fulfilling the perk required shipping. If so, campaigners would be able to choose from a list of locations and set a price for any location. As campaigners selected a location, the interface would enable the option to enter a price for the rest of the world. 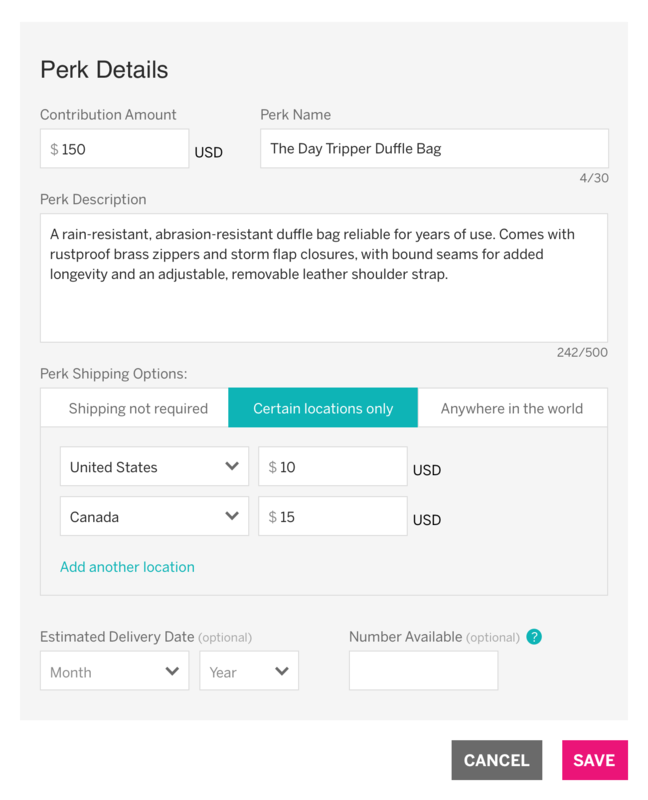 For example, a duffle bag might ship in the United States for $10, but $25 for any location outside the United States. We explored a second interaction model that was slightly different, in that it asked the campaigner up front about whether they required shipping, only planned to ship to a select few locations, or intended to ship anywhere in the world. If the campaigner chose to ship to only a few locations, the interface allowed campaigners to specify as many locations as needed, but never a value for the "rest of the world". In order to ship everywhere in the world, campaigners had to make the explicit decision up front, and then specify additional countries that might have different rates. And finally, our third design was a hybrid solution that allowed campaigners by to specify multiple locations in addition to using an explicit row for anywhere else in the world by default. This interaction required campaigners to delete the "everywhere else in the world" row if they chose to ship to certain locations only. At Indiegogo, the design team consists of both product designs and user researchers who partner and collaborate to develop the overall research strategy, conduct usability sessions, and synthesize key findings and insights to iterate and improve the product design. For each of three design directions, we conducted in-person usability sessions with 14 research participants. We built hi-fidelity clickable prototypes that were designed to test the following three use cases. 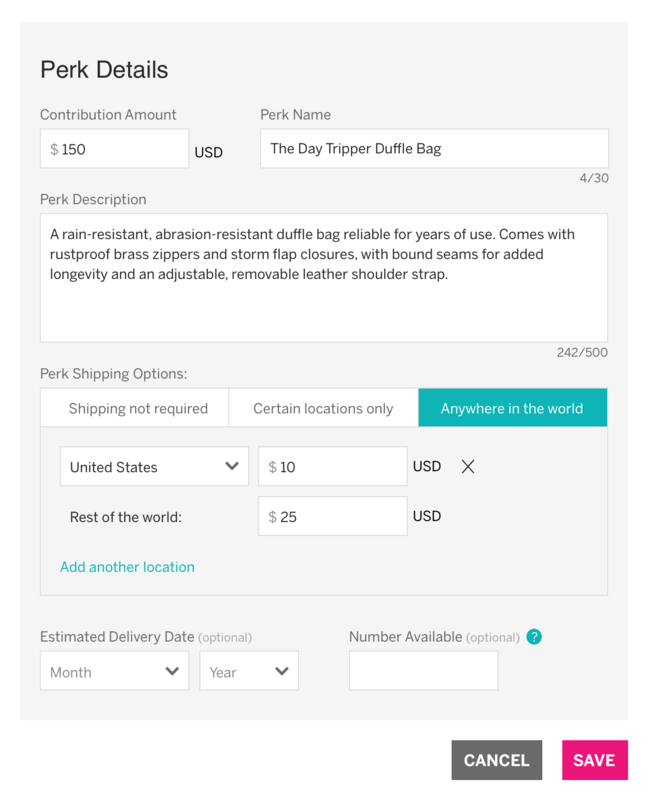 Perk only ships in the United States. Perks ships everywhere in the world, but at different shipping rates. Perks ships everywhere in the world for the same flat rate. 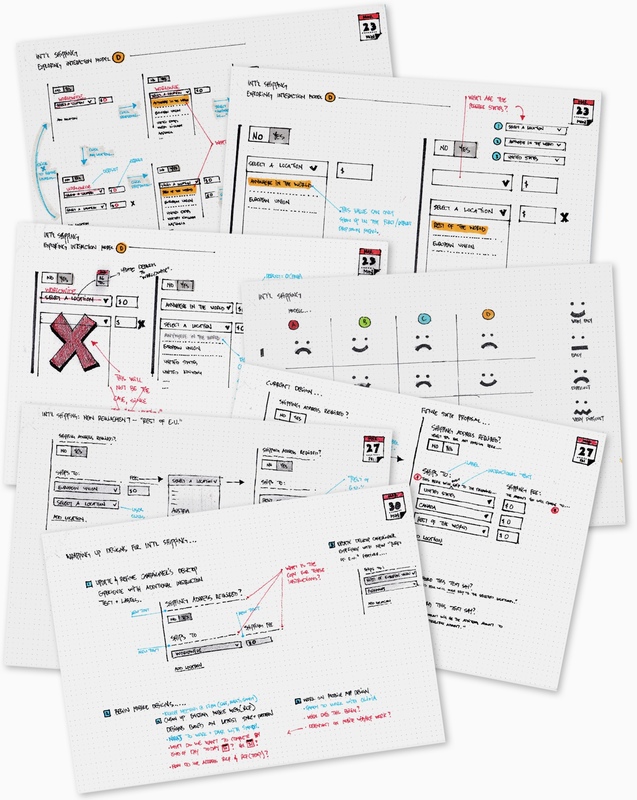 Each of the initial designs supported one or two use cases, but none of the designs did well across all three use cases. Sketching out the details of Design Concept D.
Based on the usability findings from the previous rounds, I began sketching a fourth design and quickly worked with my team to create a new prototype for round of usability sessions with 6 additional participants. This design started with the assumption that if campaigners want to ship, it's mostly likely for the "worldwide" scenario. The use of an simple active dropdown proved to be fairly easy for users to quickly realize that they can easily specify other locations instead. Design D tested better than the previous design concepts, and did especially well for the most common use cases for Indiegogo campaigners: shipping perks worldwide. We wrapped up the designs and worked with our product manager and engineering team to successfully release this new feature to Indiegogo users. Since then, we have continued to improve the user experience and have updated the visual design as part of a new project to allow campaigners to itemize perks before they launch their campaigns.